Villas in upscale Rancho Mirage located between La Quinta, Indian Wells and Palm Springs boasts five pools and four spas, seven lighted tennis courts all behind security gates. WIFI INTERNET ACCESS, Washer/dryer, flat screen televisions. two ovens, microwave as well. The condo is turnkey furnished and enjoys quiet mountain views from the kitchen and outside areas. Mountain View Villas is quiet gated community with large open grassy areas that have excellent mountain views! Bedrooms are newly furnished and spacious. The second bedroom having a new queen bed/mattress. There is a private enclosed patio area. Mountain View Villas is a gated community with seven tennis lighted courts, five pools, spas and very quiet and private. Condo is clean and just the right size for us. It is a great location. Shopping and dining area very convenient. The grounds are beautiful and the views of the mountains are wonderful. We would recommend to others. I have been staying at Herbs condo for many years and it is always a great time. Every year it gets better and the location is perfect. Thank you! Nice to stay in a condo that has been remodeled and great pools, spa and tennis. It also is close to everything in the area. Comfortable, quiet and safe. Highly recommend this condo. 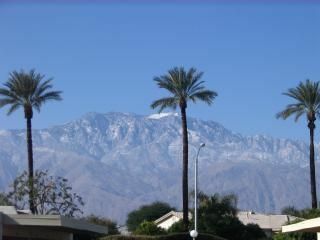 conveniently located between Palm Springs an La Quinta.